Pros: So many other reviews here offer a good detail of what this course has to offer: lots of elevation changes, challenging lines, nice secluded hike in the rocky, brushy Texas hill country terrain. Unique holes that are well shaded and a pleasure to play. Cons: Sad to say, but this course is going downhill, fast. for all the pros of this course, there are a lot of cons. -WAY too much brush and growth to hit lines with any amount of accuracy on some holes. making some approaches near impossible. Tee signs indicate alternate routes on some holes, but they simply don't exist due to overgrowth. -Teepad signs are missing on at least three of the holes, while others are faded and useless. Only about 12 of the 16 holes have usable signs. -13 and 14 are "under construction" and are essentially gone. -Lack of fairway entirely on some holes, where there is literally only a thin rock path, and tons of underbrush along the the throwing line. Lost disc are not uncommon out here, especially on the alternate holes, and hole 12. -The bridge on 18 is starting to fall apart, and I question the safety of if. This course needs work. I'd LOVE to help out here and try and clean it up with the grace of the church, but I have no idea who to contact. This is such a beautiful and challenging course, it's too bad nobody has given it more curative attention. Other Thoughts: Take some water. Pros: I enjoyed a good portion of the holes on this course, but there were definitely a few that were challenging to the point of not being fun at all. Cons: - Some tees were difficult to find. - Hole 15 is too tight and needs some branches cut out. Other Thoughts: I probably won't play ARBC again until the winter. I think it will be a more enjoyable playing experience in cooler weather and with thinner brush. Other Thoughts: Wow, Austin has some good courses, this is one of them for sure. I do not recommend playing this course by yourself, there are several holes you need a spotter for. This is a Church that has some land they made available for a disc golf course, and what a piece of land. John Houck is a good job (as always) laying out this course. Parking is literally on the dam, There is a kiosk map at the entrance to the course, a short walk down the path (that could use some markings, I walked down the wrong path the first time) to hole 1. After these first 3 holes, I was super excited about playing this course. I played from the blue (long) because there is where the tee signs were. Hole one starts off with a reachable shot, don't throw too far off the left or you are down the hill. Hole two is a true 2 shot hole throwing across a ravine up and to the right. Hole 3, another two shot hole throwing mostly open with a dogleg to the left and down the hill and across the small creek. Hole 4 takes advantage of the natural fairways with a little work. A 2 shot fairway running to the right. Then back to some 2 shot holes, 8, 9, 10, all taking advantage of natural fairways. 11 has you throwing up the hill with a tight fairway. Then you have two alternate holes. Hole 11A plays around 300 ft up the hill, this is an awkward angle to throw your drive with almost no fairway. We had to walk up 1/2 way to the basket before we could even see it. The fairway consist of short shrubbery that is nasty to get into. Hole 11B is almost the same shot going back down the hill. REMEMBER, your disc is going to float, throw a mid-range and HAVE A SPOTTER. The guys I was playing with threw drivers, both landing way to the left of the basket, I threw a classic rock and landed 20 ft from the basket (but behind a cedar tree) This hole also does not have much of a fairway. Then to hole 12, a similar shot to hole 11B in that is is downhill and the shot is over the tree's. There is a clear area at 300ft between holes 9 and 10's tee. The basket is past this after another tree line. There is a nice gape between clear areas. then to the swamp hole #13, watch your step, water table is high here and most of the fairway is muddy. Hole 14 is another classic John Houck two shot fairway down and too the left. Hole 15 looks easy enough, till you overthrow the basket with that fall off behind it. 16 is a nice longer tunnel shot with a hill on the left hand side. 17 is a good opportunity for a 2, just don't throw to the right or your in the pond. 18 has some distance but is another open hole, over a walking bridge and to a nice grassy green, but a shot landing to the left of this hole is looking at the pond. In all, this is a well rounded course that makes you use every shot in your bag. Lots of risk reward shots. Now for the question, would I play here again? Yes, This is a course I WANT to play again now that I have played it once. I feel I left a lot of good shots out there. I want redemption. I didn't keep track of my score, but it was not good. Pros: The course is great shape. With it being late winter there's little ground foliage and vegetation and nominal overgrowth to contend with which means you should get out and play this gem of a course. Errant discs were fairly easy to find. Not many ant mounds or bugs either. It'll be a lot different in few months. Cons: Signage could be upgraded. A couple of holes across the street near the ball fields has some water seeping up from the ground due to the nearby underground springs and high water table. The path to the tee-boxes are normally wet and muddy. Not too terrible but will need to be cautious with your steps. Other Thoughts: I was witness to a skip ACE on # 6 (148' tee-box). My brother scored his third ever hole in one on a fairly difficult short par 3. A very narrow tunnel leading to the hole that is lowered than the tee box with a few trees up near the basket. 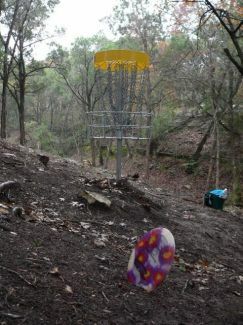 His disc caromed off the rocks about 20 ' from the basket, tilted vertically as it went into for the ACE. Stupendous Shot!!! The variety for the holes themselves is really good! There area many different shapes on holes- not only with doglegs but in elevation changes. Length-wise this course boasts many shorter holes but a ton of long bombers as well. The technicality is the most divisive factor for this course, as accuracy is ridiculously important if you want to stay competitive here. However, the design is truly exceptional. It's more than worth a visit if you are a very skilled player or if you're down for a major challenge. Cons: It's pretty unkempt overall, so even some fairway shots can be hard to find in the tall grass. With elevation comes errant shot hell, so one slip-up and it can be awful trying to find your discs. Also, the signage is somewhat lacking, so I had a really difficult time not only finding the course but also where to start. Despite calm days, there are a few holes in the hills that somehow are always windy for me. It happens, just be aware. There are some hikers that walk the trails as well as the course. It isn't frequent enough to sway your opinion of visiting for the first time, but it can get annoying. Other Thoughts: Austin Ridge Bible Church has matured into a great course. This almost entirely wooded track is exactly what you would expect from a John Houck design and the course is getting to be pretty well worn so the lines are fair and the trails are mostly pretty easy to follow. In classic Houck fashion there are tight lines and many holes that require accurate placement off the tee to set up the following shot, plus a plinko hole or two (this course has two, 7 & 15). The course makes great use of the natural features of this gorgeous hill country terrain. There are small ravines and a creek in the area around hole 1-3 & 6-7, the middle holes 8-12 plus the bonus holes play across a scrubby wooded hillside, the backside features some longer fairways, and the final two holes make use of a small pond. Some of my favorite spots are hole 3 with its picture perfect green next to the creek, hole 17 the green nestled next to the pond, the short but demanding uphill hole 11, and the downhill bomb on hole 12. The holes are challenging and require accuracy and a good game plan. There are 8 par 4 holes (9 if you count the bonus holes) and each of them requires a well-placed shot off the tee to have a look at a birdie. An eagle doesn't seem likely on any of them either. The short tees have the same par as the long tees but at least half of the par 4 holes should probably be par 3 on the shorts. I really like this course; it is easily one of my favorites in Austin. It seems like a lot of the early reviews don't reflect the current condition of the course. The tees and signs are great and the lines are fair but tight. It is typical Houck in that regard so if you live in Texas and have played many Houck courses you know what that means and what to expect, although it is perhaps a little shorter and more wooded than other Houck courses. A must play for serious golfers. Pros: (4.033 Rating) (RE-EVALUATED) A moderate length layout with extreme elevation and technical lines. - NATURAL BEAUTY - At 289 courses played as of this re-evaluation, I still have this course in my top 5. Don't trust the gloomy pictures under the media tab, those pictures were taken on a rainy day. Hole (B) is still my all time favorite looking shot in Austin, which is a top of the world shot looking over the countryside. Several other fairway designs are worthy of pulling out the camera and snapping a photo. - UNIQUENESS - An equally amazing aspect of this course is the hole type variety. The layout is mostly heavily wooded, but there are some openish holes, especially on (18). There are also a few longer holes with wider placement areas. The course is of moderate length and it's comes in at around 7,300 feet long. Holes range in length from sub 150 feet to almost 650 feet. There are eleven par 3s nine par 4s. There are dogleg par 4s in both directions, bomb it par 4s, twisting par 3s, rock elements, pockets, water clears and more. This was the 22nd course I had ever played back in 2015 and it still holds up as one the more diversified layouts I have ever played. - ELEVATION - Lots of elevation change, probable amongst the most in Texas. There is a topography course map for this layout in the DGCR links. On this map, there are 50 two-foot increment lines between the basket and tee for holes (A) and (B). That's 100 feet up on (A) and 100 feet down on (B). Hole (12) is about a 50 foot down shot and the remainder of the holes almost all have mild to moderate grade changes. - EPIC HOLES - As of this re-evaluation and also the 4,326 unique holes played, I still have three holes here in my top 100. In order of my rankings its (B), (3) and (12). (B), as stated in the elevation pro, is a 100 foot down shot. Hole (3) is a wide dogleg left hole. The second shot on (3) is 50 feet down and over a creek with a rock cliff face as a backstop. Hole (12) is a 50 foot down hill partial tunnel shot. - CHALLENGING - Having played just about every noteworthy course in town, IMO the back tees here are in the running for second toughest layout in town behind Roy G's blue layout. The course is mostly a finesse course but being able to throw straight 400 feet definitely helps. I figure that a 965 rated player will average below par out here. Intermediates should be able break par from the short tees. - SHOT SHAPING - Any player that loves to craft shots will love this course. - CHARACTER - A touch above average. Nice sized tees that are 6 feet by 10 feet. Great baskets, adequate tee signage at the back tees and lots of tee shading. About 2/3 thirds of the holes have multi-tees and an equal amount have benches. Missing items I would have liked to have seen included are alternate basket locations and a course map posting. - FORGIVENESS - All the fairways widths and lines to the basket appeared to be fair to me on my first play. However, missing you line can have disastrous consequences. There are several substantial thicket areas out here with wicked retrieval elevation to deal with. Several holes I would recommend using spotters, especially on hole (B). My group of six spent almost an hour searching for discs during the round. There is also an unforgiving water play on (18) and a miss to the right means swimming down or a lost disc. - OVERGROWTH AND MAINTENANCE - This is perhaps the is the biggest complaint one will hear about this course. The terrain is just so crazy that it's not surprising that they only beat it back a couple times a year. This course is likely way more enjoyable in the winter with dead vegetation. - BEGINNER FRIENDLY - Way too difficult for beginners and level novice players. Players that haven't thrown over a hundred rounds of disc golf will get eaten alive by this course. There are two sets of tees, Blues (advanced) and Reds (recreational). The Reds play more like a tweener between Intermediate and Recreational. As a player with about an 850 rating back in 2015, I think the red tees gave me all the challenge I needed. - TERRAIN - If you have bad knees or ankles, I'd stay clear of this course. There are lots of rocks and roots to stub a toe or twist an ankle on. This course is not cart friendly. - TIME PLAY - Bible Ridge is going to take a chunk out of your day. My group playing the front tees spent 3 1/2 hours here. Solo players will likely need at least 90 minutes. - NAVIGATION - This course suffers from some navigational issues. The group of six that I played with had two past players and we still found ourselves lost at times. I highly suggest printing the map on DGCR. There use to be a posted course map out here, but it no longer exists. The holes signage is adequate, about average for Austin, has next tee directions on them. Other Thoughts: Austin Ridge Bible Church, AKA, Bible Ridge, is one of the three Jewels on Austin's south side along with Circle C and Roy G. Players that enjoy epic and extremely beautiful courses will love this place. I personally credit this course to beginning my addiction of bagging courses. Please be sure and look-up an accurate source with up-to-date conditions before playing here. Playing here during summer's peak overgrowth period and without a recent mow, will be a nightmare experience. I was very fortunate to play my first and only round here a few days after a major maintenance event. - RE-ELALUATION - After re-visiting the Austin area in April 2018 is decided to give this course another look based on my revised views on how I rank courses and peaking at the recent reviews. I had this course originally just over the 4.25 barrier, but now I have it as a 4.0 rating as I've seen a ton more courses since first posting. Regardless of my re-evaluated score, Bible Ridge is still one on my all time favorites and it opened my eyes on what an epic course looks like. Pros: This is a short, technical course that rewards precision over distance. Built in the Texas Hill Country through thick "cedar" trees, the fairways are tight and the rough is punishing. Two tee positions on most holes, and the ability to choose the shorter tee was very welcome. The short tees are plenty challenging, with the long tees bordering on "too" challenging for this 850 rated DG'er! Half of the holes from the short tees are 250' or less. This would usually indicate a "Pitch and Putt" course, but not this time. These little holes are tight and require that you shape your drive well. There are five 400'+ holes, and all but one are par 4's. These require a careful drive to a landing area, with a second accurate approach to the pin. Miss either of the shots and you're scrambling for bogie. Concrete tees and excellent tee signs, along with a few benches and trash cans offer all that you can ask for in a course. Porta Potties near the first tee are welcome. Cons: Navigation was a little tricky, as there are numerous trails winding through the area. Some lead to the next tee, others do not. Make sure to look at the "next tee" arrow on the tee signs and carry a copy of the map. The terrain is rough and rocky. This is not a course for base plastic discs, and even your premium discs will get nicked and scuffed. If you love bombing drives over open ground, this is not the course for you. Other Thoughts: I think it is remarkable that a church has incorporated this excellent disc golf course into their property and opened it up to the general public. I hope that we will respect the wishes of the church by not littering, watching our language, etc. Concrete teepads on all holes. Two teepads on most holes. Good variety of shots required. Good variety of hole shapes and lengths. Houck design, meaning clearly defined lines and landing zones on all holes, even if they are hard to hit sometimes. Creek in play on 4 or 5 holes makes a fun challenge with little chance of losing a disc. Pond throwover on 18, the long tee is a good challenge and the short tee is reachable for most players. Also, easy to bail out to the right if you don't want to risk the water at all. Good elevation changes, especially for Texas. Difficult terrain, rocky and uneven. Difficult to navigate the first few times. Discs can be surprisingly difficult to find in the "cedar forest." Bonus holes 11A and 11B are both blind landings, I don't play either by myself (see above con). Discs lost in the pond on 17 or 18 are usually difficult to retrieve due to cattails. Could use more benches and trashcans. No long open holes (not really a con for me, but I know some people love to bomb). Other Thoughts: This is generally agreed to be one of the top 3 or 4 courses in the Austin area, and is many people's #1. The level of play is not necessarily too hard for beginners, but due to the lack of water and the difficult terrain this is a course that one needs to be prepared for, whether beginner or pro. Navigation can be a bit tough, so it would certainly help to have a map or guide the first few times. The Houck design means it is often tough but fair. Short and long teepads let you choose the level of challenge, although I have been told the course was "meant to be played" from the longs, and the longs are certainly more epic shots or more strategic shots on many holes.